HomeUnlabelled How to prepare VAO exam and group 4 exam? You are trying to pass tnpsc VAO exam and group4 exam? Any person who has a strong intention to pass vao & Group IV in First attempt, can do so, with a strong Self Preparation Mechanism. Yes, no need to go for any coaching for passing in Group 4. The key for success is in your hands. Qualification for TNPSC Group 4 Exam. Before we move on to tips for preparation, let us see who can appl for the Group IV exams. 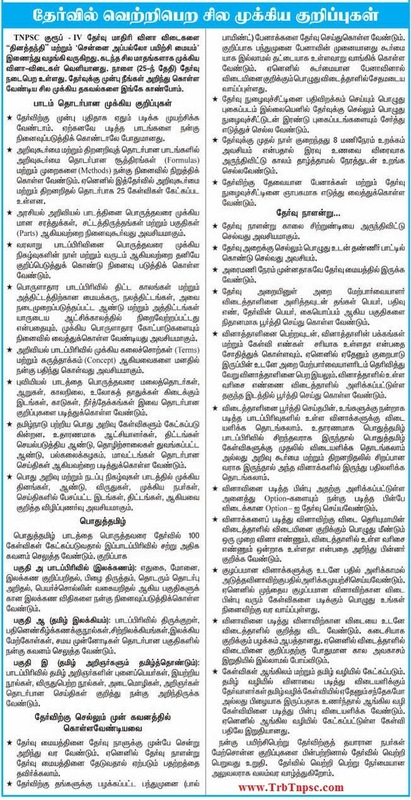 Any one with a SSLC qualification / 10th Standard Pass is eligible to apply for the TNPSC Group 4 Exams. The dream of most of the people in Tamil Nadu is to get a Government Job. When it comes to any job related to government, TNPSC is always the First Choice amongst the Job seekers. TNPSC recruits candidates every year through Group 4, Group 2, Group 1 and other exams. Among all these exams, Group 4 exam is the most popular one and is being applied by more than 10 Lacs people all over Tamilnadu, every time it is being announced. To start with, refer the Tamilnadu State Board Samacheer Kalvi Books and study each and every line of the 6th Std - 10th Std Science, Social Science and Maths Books. The Pothu Tamil / General English paper, as per the option that you have taken, helps you to get good marks, in addition to General Knowledge. Since most of the Job seekers opt for Tamil, lete us see which book to should focus more on. Try to buy Pothu Tamil guide from any leading publications such as Vikatan Publications, Sakthi Publication or Eagle' Eye Book and prepare well from these books. 1. Tamil Nadu State Board books are considered to be the primary source of TNPSC Exam preparation. They are the souce for question paper setting team too. So you should go back to your school days and study the following school text books. 2. History - Refer the given below two books for preparation of History related information. 3. Indian Polity - Refer the given below book for preparation of Indian Polity. 4. Indian Economy - Refer the given below book for preparation of Indian Economy. 7. Current Affairs- Refer the given below books for preparation of Current Affairs. 8. Science & Technology - Refer the given below book for preparation of Science and Technology. 9. Refer the "India Year Book" by Government of India for General Knowledge. Refer all the above books and prepare well. All the best!